There is nothing you can do when Mother Nature decides to do her thing. Two back to back hurricanes hit the United States and caused plenty of devastation in their respective paths. The first was Hurricane Harvey that hit Texas, especially the city of Houston, brutally. This caused the NFL to move the scheduled preseason game between the Dallas Cowboys and Houston Texans from Houston to Dallas. 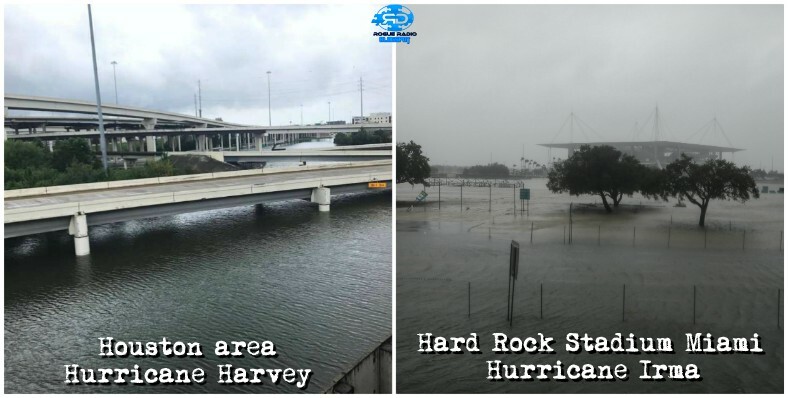 The Texans could not even return home or their practice facilities because of the water Hurricane Harvey left in it's wake. Texans DE JJ Watt raised millions to help the people in that area that were displaced by the event. Within a couple of weeks, Florida was hit with Hurricane Irma. This postponed the game between the Miami Dolphins and the Tampa Bay Buccaneers. As a matter of fact, the NFL gave both teams the week 1 bye. Most players were not happy with the decision because now both teams had to play a straight 16 weeks without a break. In both instances, players found ways to help the communities they represented and friends and family members affected by the hurricanes. Some would say that this would be a sign of how the season may go. Sudden death for some. A fresh start for others. The first half of the season brought down some heavy hitters. Anyone who played fantasy football this year can attest to that. Who got the first pick in their draft and chose Arizona Cardinals RB David Johnson? Dream pick for anyone until he hurt his wrist week 1 against the Detroit Lions never to return this season. The Cards were hit with another blow when QB Carson Palmer went down with a broken arm in week 7 against the Los Angeles Rams. Almost the same scenario in Houston. As if the hurricane was not enough, the Texans lost DE JJ Watt in week 5 to a tibial plateau fracture and QB Deshaun Watson to an ACL tear in week 8. Green Bay lost QB Aaron Rodgers in week 6 to a broken collarbone and Miami lost QB Ryan Tannehill to a torn ACL in preseason. None of these teams recovered during the season. On the other hand, the Minnesota Vikings lost RB Dalvin Cook in week 4 with a torn ACL, New England was without WR Julian Edelman with the same injury in happening in preseason, and Philadelphia carried on after QB Carson Wentz ended his season in week 14 with not just a torn ACL, but a torn LCL and IT (iliotibial) band tear. Those teams went on to great game play and the Pats and Eagles are playing for the Super Bowl this year. There were many other significant injuries this year to notable players, but we could be here all night going through them all. Is there any way to prevent ACL injuries? They occurred more than any other injury this football season. Let's hope that everyone can recover healthy and return for camp this year. Some of the most impactful players were rookies this year. First round picks like Jacksonville Jaguars RB Leonard Fournette, Carolina Panthers RB Christian McCaffery, New York Giants TE Evan Engram, and New Orleans Saints CB Marshon Lattimore had exceptional years. Second round pick, Pittsburgh Steelers WR JuJu Smith-Schuster and third round picks New Orleans Saints RB Alvin Kamara and Kansas City Chiefs RB Kareem Hunt did not disappoint either. With the exception of Engram and Hunt, all of them played in the post season. They ranged in accomplishments from Hunt being 4th in the league in rushing yards with 930 to Kamara scoring 14 TDs (8 rushing, 5 receiving, and 1 kickoff return for a TD). By no means did their teams not get what they bargained for out of these young men. With the good comes the bad though. Quite a few rookies did not live up to the potential teams expected. Those would include a number of first round choices to include Cincinnati Bengals WR John Ross, Tennessee Titans WR Corey Davis, Tampa Bay Buccaneers TE O.J. Howard, New York Jets S Jamal Adams, and Detroit Lions LB Jarrad Davis. There are many reasons why they did not perform up to expectations. They could have had injuries or just did not fit the systems they were drafted to play in. Let us not forget the couple of rookies that just were not given a fair chance of producing well. That couple could include rookie quarterbacks Mitchell Trubisky in Chicago and Deshon Kizer in Cleveland. One can only hope that their organizations will put better players around them next season. Overall, this years rookies have performed well. It was a pretty impactful year for them. Good or bad. How many teams looked great until the season started? Quite a few. If anyone watched the HBO series Hard Knocks, they would have thought the Tampa Bay Buccaneers stood a fighting chance. How about the Oakland Raiders? They were coming off of an 12-4 season and signed an "unretired" running back in Marshawn Lynch. Of course, predicting that QB Derek Carr would get hurt was impossible. Did anyone think the New York Giants would experience such a poor season? It seemed like they were just waiting to get WR Odell Beckham, Jr. back. No one guessed that they would eventually bench QB Eli Manning breaking his streak of starting 210 games over 13 seasons. Another "unretired" player was signed in Miami since QB Ryan Tannehill was not able to be under center. Jay Cutler did not turn out to be the answer to their prayers. Trading of RB Jay Ajayi to the Super Bowl bound Philadelphia Eagles did not do much in their chances to save the year either. Even though Houston ended up losing DE JJ Watt again to injury and the weight of the city on their shoulders since Hurricane Harvey, rookie QB Deshaun Watson appeared to bring an air of excitement to the team. That did not last long as Watson got hurt and QB Tom Savage took over the reigns again. Detroit Lions QB Matthew Stafford signed the largest contract in the NFL before the season started. That did not pan out well for the Motor City. Other pieces just did not fall into place. Some of the struggles were real for teams. For other teams, it turned out to be the year of a lifetime. After losing QB Teddy Bridgewater and RB Dalvin Cook, the Minnesota Vikings seemed a little unsteady. Not for long, QB Case Keenum and WR Stefon Diggs had something to say about that. In Jacksonville, the Jaguars did not look like a playoff caliber team with QB Blake Bortles at the helm. They were the team that had to prove to everyone that they were not a fluke. On the back of RB Leonard Fournette, they played for the AFC championship. With all the troubles in Buffalo and a little help from Pittsburgh, the Bills found their way into the first round of the playoffs. That was unexpected. Sean McVay down in St. Louis made his mark bringing last year's lackluster rookie performance of QB Jared Goff to an amazing production of skill and showmanship. RB Todd Gurley was not so shabby either in their rise this year. Philadelphia could not be stopped this go around. They literally came from the bottom to the top. The addition of RB Jay Ajayi was a plus. Although it looked like the season was in jeopardy with the loss of QB Carson Wentz, backup QB Nick Foles continued the journey ultimately leading them to a chance to become Super Bowl champions in Super Bowl LII. For these teams, struggle paid off. This brings us to the final game. All of the events of the season have brought us to this point. The champion of all of the drama, injuries, on/off field issues was crowned on Super Bowl Sunday. Who would have guessed it would be a team that would get it's first Super Bowl win EVER?! Such a great feat for a team that lost it's starting quarterback in week 14. A backup quarterback in Nick Foles could not possibly bring home a championship, could he? It appears all of the odds were stacked against the Philadelphia Eagles, especially going up against the ultra-experienced New England Patriots. They proved everyone wrong. The Eagles were a complete team and almost played themselves out of a win. The Patriots put up a great fight with a charge led by QB Tom Brady. The effort was not enough though. No amount of adjustments and "phantom" calls could keep the dynasty going for the Pats. The Philadelphia Eagles completed their Cinderella story. Coming from the bottom of the NFC East to the winners of one of the most coveted trophies in all of sports. History was made by the Eagles. It was a game for the ages, and the best team won! This season happened. In spite of Mother Nature. In spite of controversy. In spite of injury. In spite of experience. THIS SEASON HAPPENED! There did not need to be high viewership for professional football to take place. The mere fact that fans and non-fans alike discussed their reasons for watching or boycotting made football relevant. Whether or not fantasy football lineups were effected by injuries or not put football on the forefront of many folks' minds. The ultimate sporting championship game in the United States between two formidable teams made football the most relevant thing on ONE DAY. No matter how some looked at the season, the season was looked at. There was no way of getting around America's pastime. I, for one, thoroughly enjoyed this season. There was enough drama to give the soap operas a run for their money. There will be so many coaching changes and MEGA-contracts that next year will make your head spin. Will some of the same boycotting or low viewership occur? Of course, it will. Will there be controversy on and off the field? Why, yes! That is what makes so many tune in daily for eight months. Nothing is given on any day. I know that is why I stay glued to the TV and social media outlets. And, why not? You could not get stories like these anywhere else. Not even the movies can have screenplays like the storylines during an NFL season. Man, I LOVE THIS GAME! Thank you all again for following me this year! I have had fun and learned a lot along the way. I look forward to next season and the news that it will bring. As always, good luck to your teams and picks! Make sure you check out some of our other articles as well!